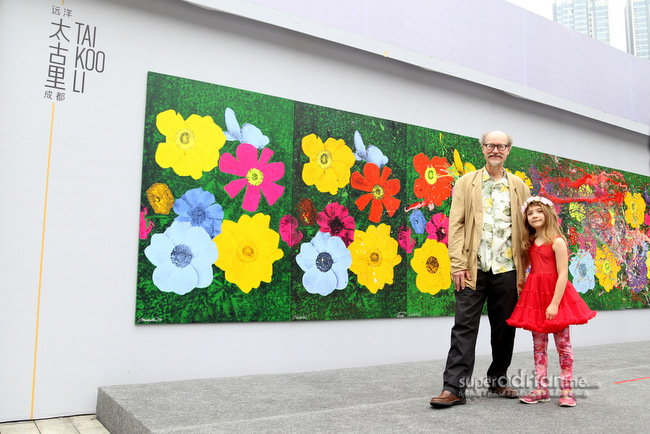 Taikoo Li in Chengdu held its global launch on 22 June 2015 where VIPs and dignitaries were present to unveil a 10 metre by 2 metre collaborative canvas painting by world renowned pop art artist and illustrator James Warhola and eight-year old Australian art prodigy Aelita Andre. Chengdu’s newest retail and dining destination. The development took slightly under five years to complete with its soft opening on 31 October last year. Sino-Ocean Taikoo Li centres around the old Daci Temple (also known as the Dashengci Temple) which is around 1,700 years old. The slight drizzle did not dampen the spirits at the official launch which was officiated by the Chengdu Municipal Government Mayor Tang Liangzhi. In fact, umbrellas were closed just before the event started as the drizzle had stopped providing a clearer view of the stage as well as those who delivered speeches. 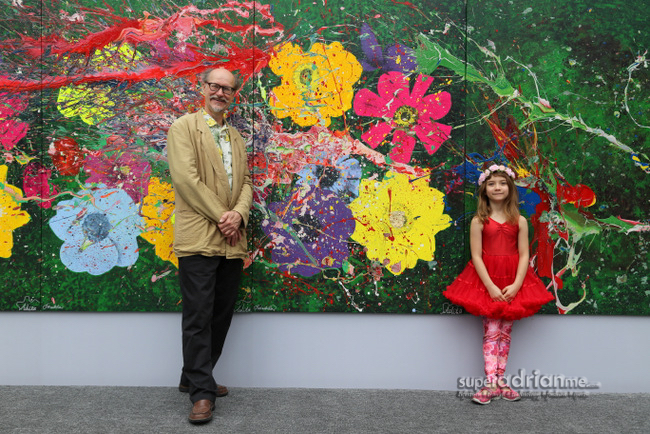 Artists James Warhola and Aelita Andre posing in front of the collaborative art work. 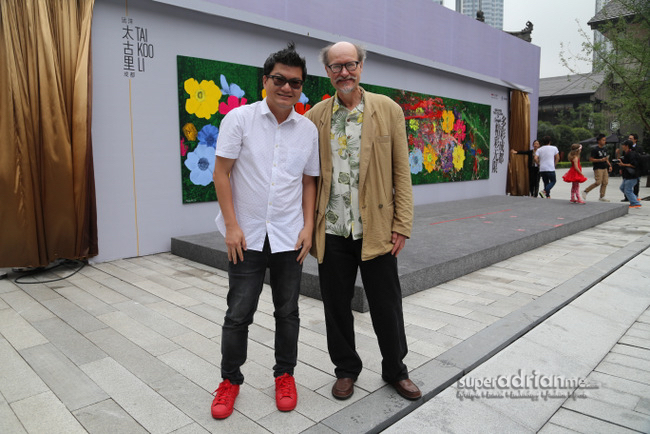 “Chengdu Garden” is the two artists’ rendition of a prosperous and harmonious modern Chengdu as well as the essence of Sino-Ocean Taikoo Li Chengdu’s colourful and diverse character. The blend of colours used showcases the city’s vibrant spirit. “Chengdu Garden” is currently on special display at Guangdong Hall. Nature is the inspiration behind the artwork by James and Aelita. Flowers are universally beautiful and symbolise Spring’s rebirth from the cold winter months. James chose Anemones originate from this part of the world and brightens up many gardens throughout Spring to Autumn. James Warhola’s uncle is the famous Andy Warhol. James comes from a family of artists. His grandmother was an artist and so was his famous Uncle Andy Warhol. He remembers his uncle telling him to think big and that anyone can be an artist. As an inspiration to aspiring artists, James shares that there were no rules in Andy Warhol’s books and art can be anything surrounded by artistic inspiring things. As a kid, James used to watch Uncle Andy illustrate shoes with his ball point pen. This inspired him to be an illustrator ever since. He has also done many illustrations for 300 Science Fiction book covers. You may have even come across some of these titles such as ‘Neuromancer’ and ‘Stranger in a Strange Land’. 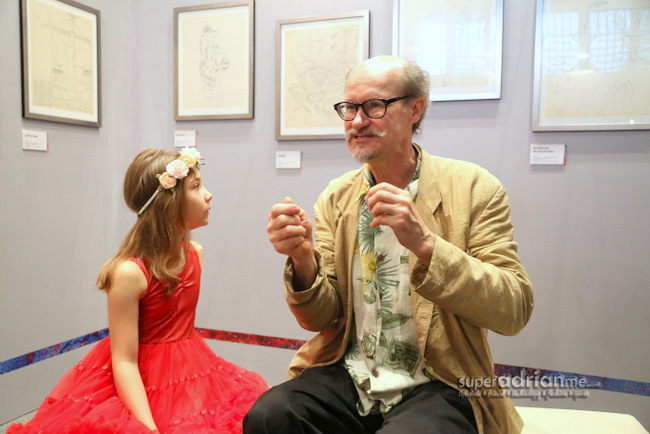 For the last 20 years he has illustrated 50 children books and till today, he still enjoys inspiring children. His most noted among them is ‘Uncle Andy’s’ which documents his childhood visits to Andy Warhol’s house. James has worked for American humor magazine, MAD Magazine painting their mascot Alfred E. Neuman. Now, James prefers fine art and enjoys silk screens and has a few permanent hand painted murals in the United States. 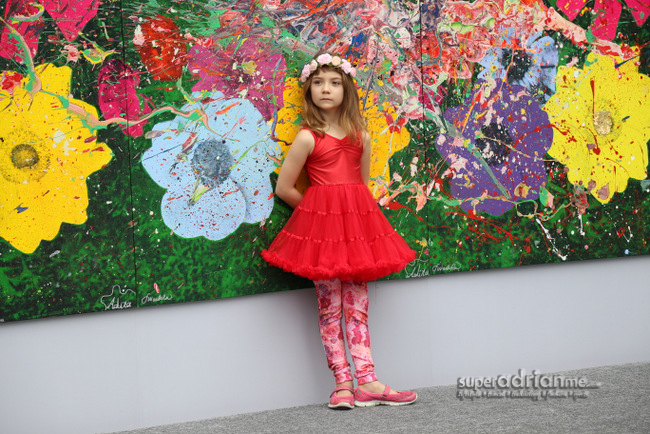 Born in 2007, Aelita Andre is an Australian born abstract expressionist painter. She began painting professionally at an astonishing age of nine months old Her acrylic on canvas paintings were featured in her solo exhibition in Australia when she was two. To the free spirited Aelita Andre, she paints like that of a dragon since she has been touching the dragons in Chinatown at the Chinese New Year Festival in Melbourne, Australia since she was one for good luck. She wants to paint the rainbow spirit of the dragon’s rainbow colours in her painting, giving luck and happiness to everyone. I asked the vivacious Aelita what here favourite colour was and her reply was a simple “all colours are my favourite. My art is my favourite colour.” How can one not admire her candour and simple approach to life. We adults have so much to learn from her. James Warhola and Aelita Andre worked collectively. James hopes to learn from Aelita’s fearless attitude. You can even see the chemistry between the two artists when they spoke with us. James was the first to paint the art work and Aelita would do her wonders with her paint after. 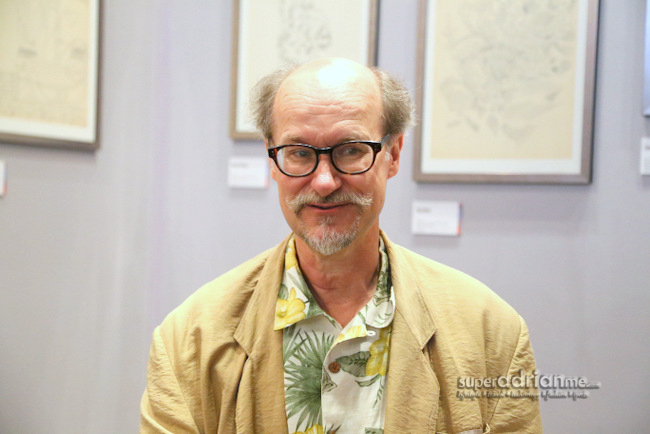 James often speaks of his envy for Aelita’s lack of fear when she paints. Something that he has to learn. Art supplies for the collaborative art piece had to be bought from China while the technicalities had to be worked out in Chengdu. What turned out after that is now this amazing piece. SUPERADRIANME.com Editor Adrian Eugene Seet doing a fan boy photo shot with James Warhola. This is James’ first visit to Chengdu, the land of Pandas. Who knows? You may one day see a Panda illustration by James.